BusinessWeek is Bracing for Inflation . Let's take a look at an article written by John K. Castle, CEO of Castle Harlan, a New York private equity firm. Growing evidence suggests American consumers, businesspeople, and political leaders should all be bracing for double-digit inflation, probably as early as 2009. The relative price stability of the past 15 years is giving way to worsening inflation, despite the recent softening of oil prices. The Consumer Price Index for all items shows the inflation rate averaged 2.6% a year from 1992 through 2007 but has doubled since January, reaching an annual rate of 5.6% in July. By next year, the monthly figure could hit double digits, and the inflation rate for 2009 overall could triple 2007's 2.85%. I say this not only because I have looked at a broad range of statistics that point in this direction. I also run a private equity investment firm that owns companies in a number of industries—including restaurants, the manufacture of gardening tools, oil and gas exploration services, and distribution of entertainment products such as books and videos—that are already being forced to pass price increases on to the consumer. Growing evidence is that Castle is way off base. Oil and commodity prices are sinking. The Great Unwind is in progress. The Future Is Frugality . Restaurants are missing bond payments or going bankrupt because business is declining and they cannot pass price hikes on. See Uno Pizza Chain Misses Bond Payment for more details. Private Equity Deals Are Waning . There are Record Declines In Case-Shiller Home Index . Banks are tightening lending standards. Jobs Decline 7th Consecutive Month . Those preaching inflation simply do not understand the Implications of the Slowing Global Economy . Let's take a look at this from a second angle; What's Hot and What's Not. Of course inflation and deflation are not about prices at all but rather about money supply and credit, and credit (especially credit marked to to market is plunging). That is restricting bank lending, business expansion, etc. Consumers now finally realize they cannot depend on rising home prices as their retirement. The Savings rate in the US is soaring. Finally, "price inflation" which is what Castle is talking about is a lagging indicator. So even from a "price inflation" standpoint, I am willing to take the other side of the bet. Year over year CPI comparisons are going to be easy to beat for quite some time to come. I used the Time Magazine cover "Why we are gaga over real estate" to call the peak of the housing market in summer of 200. And it was former Citigroup CEO Chuck Prince's statements marked the peak of lending stupidity. I used his statements to call the top in the equity markets in August 2007. I was wrong on that by a few months. The markets made a new high in November by a few percent. By November, Chuck prince had already danced out the door. Let's take a look at Prince's statements one more time. Chuck Prince: “ When the music stops, in terms of liquidity, things will be complicated. But as long as the music is playing, you've got to get up and dance. We're still dancing. "The depth of the pools of liquidity is so much larger than it used to be that a disruptive event now needs to be much more disruptive than it used to be. At some point, the disruptive event will be so significant that, instead of liquidity filling in, the liquidity will go the other way. I don't think we're at that point." 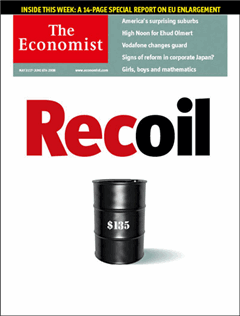 It was a cover on the Economist " Drowning in oil " predicting oil at $5 that marked the bottom in crude prices. The Economist strikes again. Please consider the May 29, 2008 cover of The Economist. Barry Ritholtz talked about the above cover in Uh-Oh: Economist Cover on Oil . For those of us who believe in such things as contrary indicators, this suggests a short term top in Oil to me. I would bet we don't see new highs in Oil for the next 6 months, and perhaps even 12 months. Thirty-five years on, oil prices have quadrupled again, briefly soaring to a peak of just over $135 a barrel. But, so far, this has been a slow-motion oil shock. If the Arab oil-weapon felt like a hammer-blow, this time stagnant oil output and growing emerging-market demand have squeezed the oil market like a vice. For almost five years a growing world shrugged it off. Only now is it recoiling in pain. Barry was off by a tad, but obviously I endorse the idea. So now we have magazine covers fretting over oil, pundits everywhere calling for $200 oil, and BusinessWeek articles "Bracing For Inflation" in spite of a slowing world economy. These are all contrarian indicators. And as goes oil, so goes the CPI. So unless there is a breakout of War in the Mideast, the oil bust may be deeper and longer lasting than anyone thinks.